My daughter is really into imaginative play lately and has been thoroughly enjoying her play kitchen! This week she found the Learning Resources cash register I got when my boys were little and she LOVES it! But the only problem is that since she is not quite 2 years old she still puts money in her mouth and tends to rip the paper money. 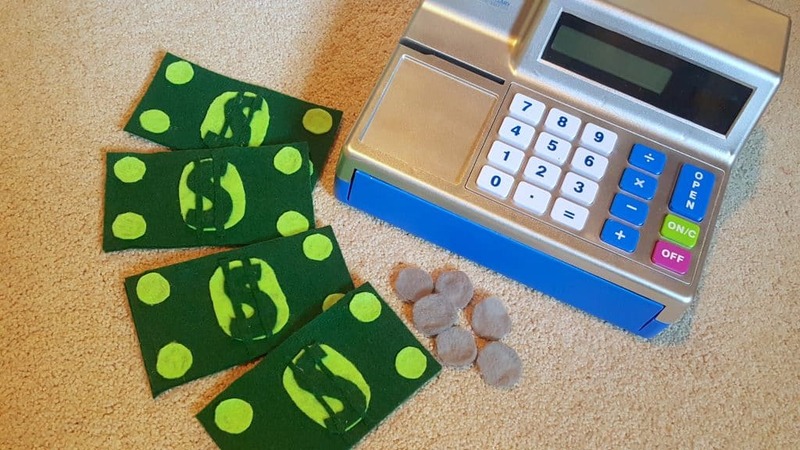 Although I could laminate the money or buy felt money online and take away the coins I wanted something quick and cheap as an alternative – so I made my own felt play money! No sew! 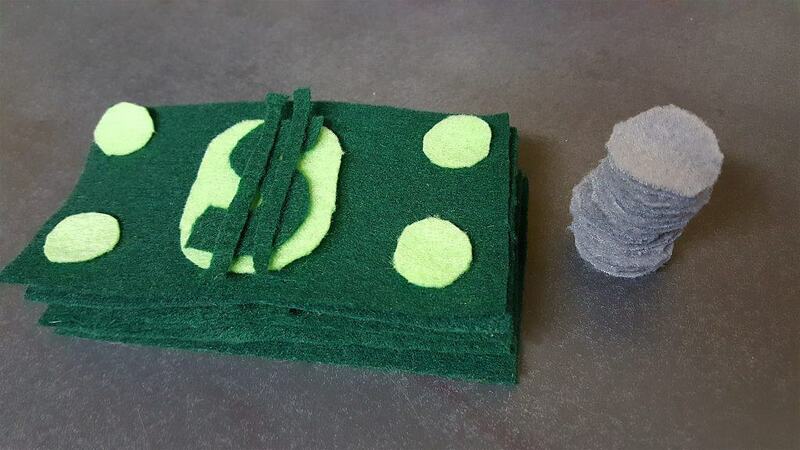 For each dollar bill and coin you want to make you’ll need the above pieces cut out in felt. 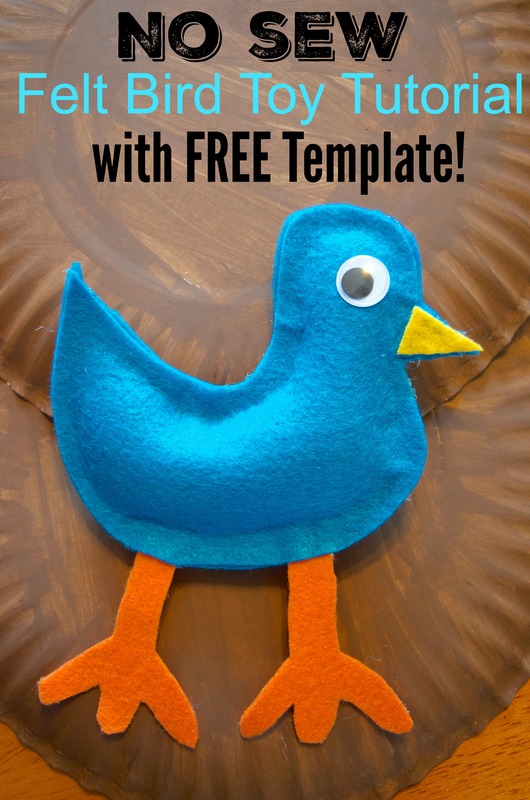 I didn’t have a template – I promise your toddler won’t notice! Remember – this is supposed to be quick and easy! I cut my dollar bills to fit inside of her cash register so she can still use it with her felt money. I began by hot glueing all of the “coins” together. Just two circles hot glued back to back is all. I didn’t decorate any of them yet but you could use an Ultra Fine Sharpie Marker to add amounts on them if you want! 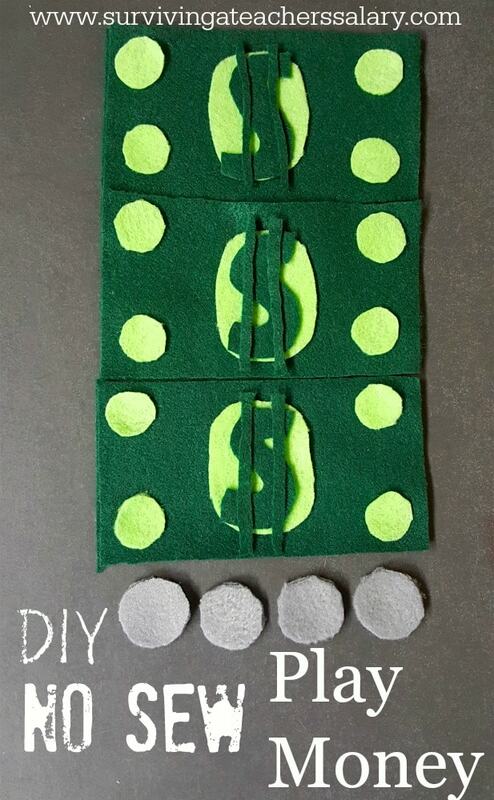 To make the felt dollar bills I started by glueing the 2 large dark green rectangles together so that the bill is a little stiff. 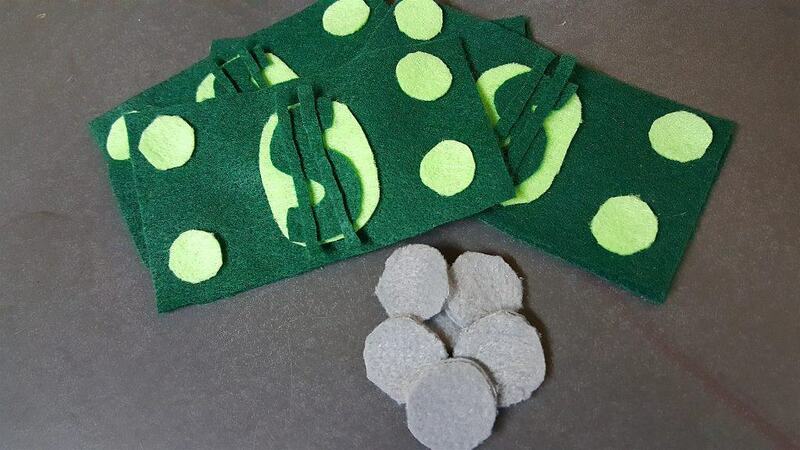 I then hot glued on the 4 small light green circles on each corner of the bill. Then I glued the “S” onto the light green oval and then glued the oval onto the dollar bill. 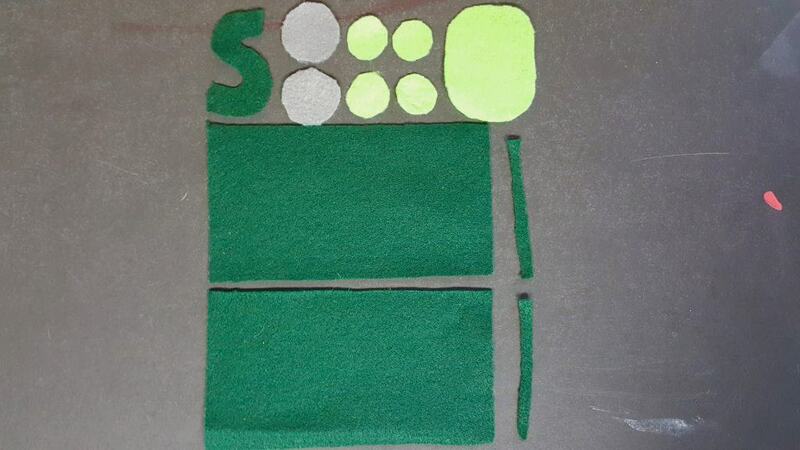 The last step is to carefully hot glue on the 2 dark green money “lines” on top of the “S”! Once you have everything hot glued really well you’ll notice a nice stiffness (but still pliable if needed) to the money making it easier to hold and stack for your toddler! Even the “coins” can be stacked! My daughter absolutely LOVES that she can put her felt play money inside of her cash register ! 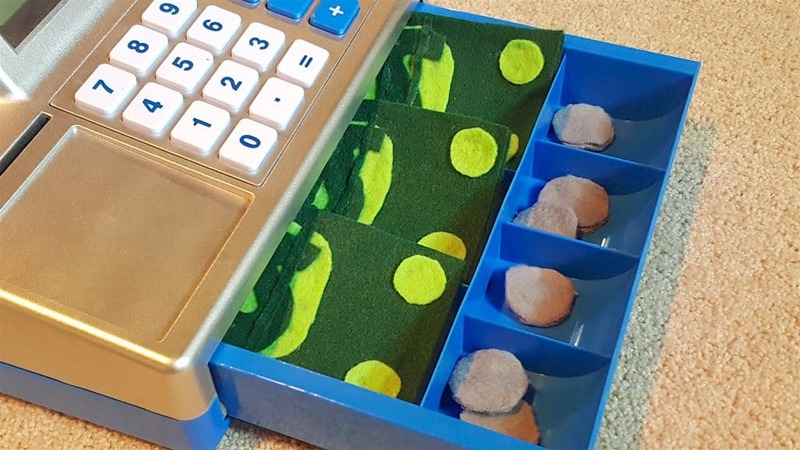 It allows her an introduction to pretend money play and simple math skills without having to worry that she’ll swallow small coins or rip and crinkle up all of the paper money. I absolutely LOVE the Sprouts Play Food if you need good quality play kitchen supplies that won’t easily break! 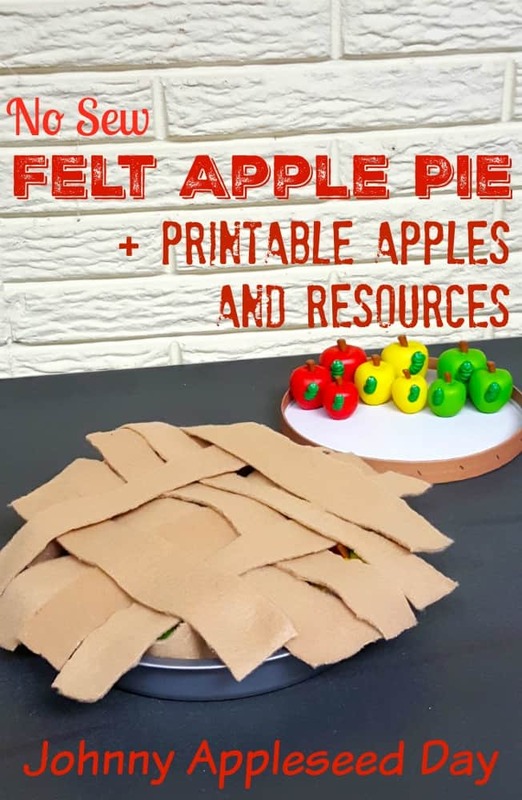 Although I also like the KidKraft wooden play food too the Sprouts play food line is more affordable and has an awesome unique variety – below are just a few of my favorite sets! 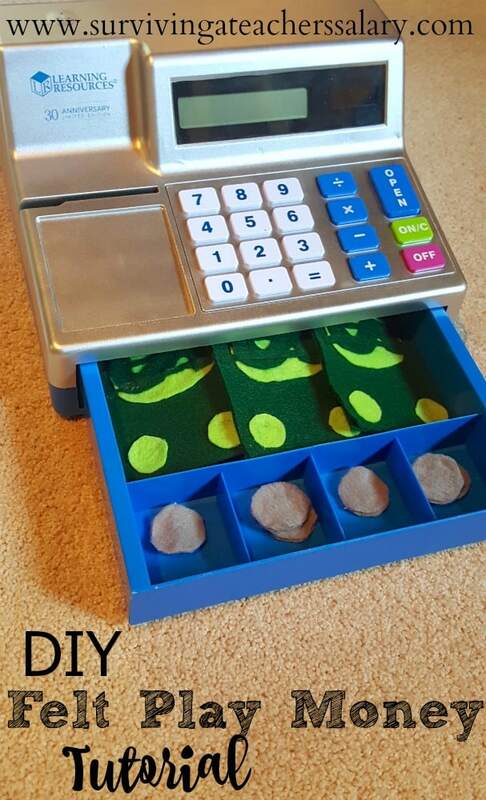 This is a great idea and perfect for my granddaughters who think that every coin is a “penny”. 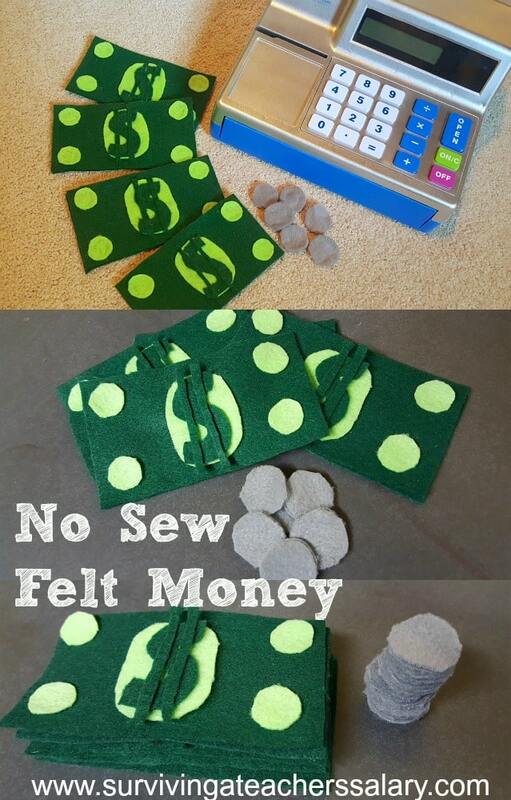 I will be making these for them to start learning their money! thank you so much for sharing at Celebrate Your Story!